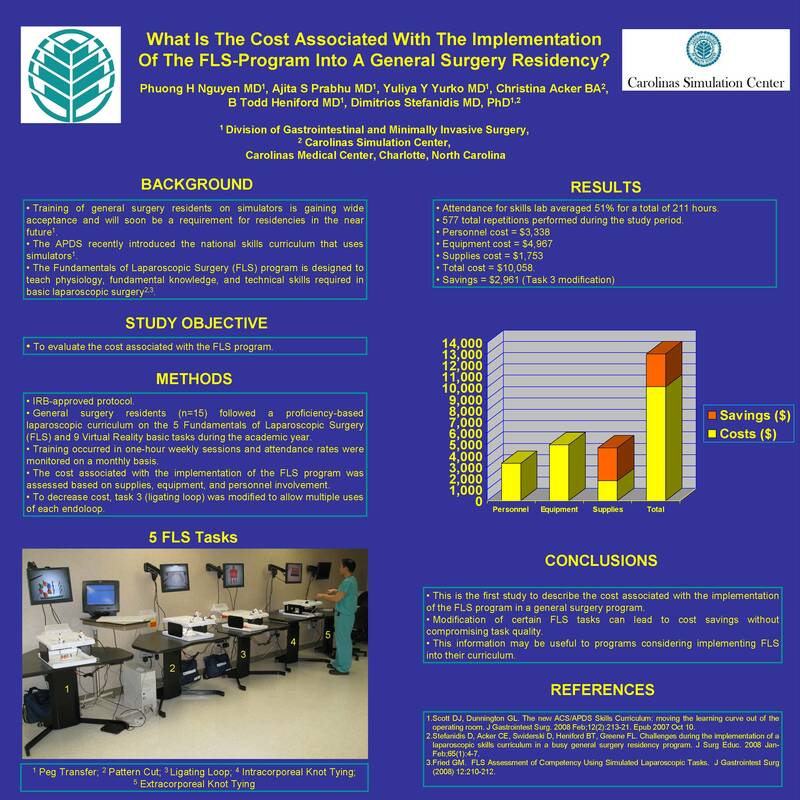 What Is the Cost Associated with the Implementation of the Fls-program Into a General Surgery Residency? Introduction: The Fundamentals of Laparoscopic Surgery (FLS) program was designed to teach the physiology, fundamental knowledge, and technical skills required in basic laparoscopic surgery. Under the auspices of SAGES and industry support the program was recently made available to all US general surgery training programs. Nevertheless, the implementation cost of the program is unknown. The objective of this study was to evaluate the cost associated with the implementation of the FLS program into the curriculum of a busy general surgery residency. Methods: All general surgery residents (n=15) followed a proficiency-based laparoscopic skills curriculum based on the FLS program during the academic year. All residents watched the FLS CD-Rom and trained to proficiency on the 5 FLS tasks (Peg transfer, Pattern cut, Ligating loop, Intracorporeal and Extracorporeal knot tying). Training occurred in one-hour weekly supervised sessions and resident attendance and performance were recorded. The cost associated with the implementation of the FLS program was assessed based on supplies, equipment, and personnel involvement needed. To decrease cost, task 3 (ligating loop) was modified to allow multiple uses of each endoloop. Results: Resident skills lab attendance averaged 51% (range 16-84%) for a total of 211 hours. Fifty three percent (8/15) of residents achieved proficiency in at least 3 of the tasks (peg transfer, pattern cut, & ligating loop) after a total of 577 repetitions during the study period. The overall cost associated with the FLS program was $11,626. Personnel cost was $3,338, equipment cost was $4,967 and supplies cost was $1,750 with the majority needed for suture ($1,242) and endoloops ($329). With the modification of task 3, each endoloop was used on average 9 times leading to $2,577 cost savings. Conclusion: This is the first study to describe the cost associated with the implementation of the FLS program in a general surgery residency. It further demonstrates cost savings by the modification of the ligating loop task to allow for multiple uses of each endoloop without compromising task quality. This information may be useful to programs trying to implement FLS into their curricula.